In a house full of men, both little and big, football season is huge. From playing on the field to watching their beloved Packers pummel opponents, football season is king. Now with the smaller men in the household participating in their own league, I think that it would be special to keep a memento of the season. Since boys aren't big on framed pictures or frilly scrapbook pages, I am always looking for more masculine ways to commemorate their sports accomplishments. A great option is Make-A-Ball. 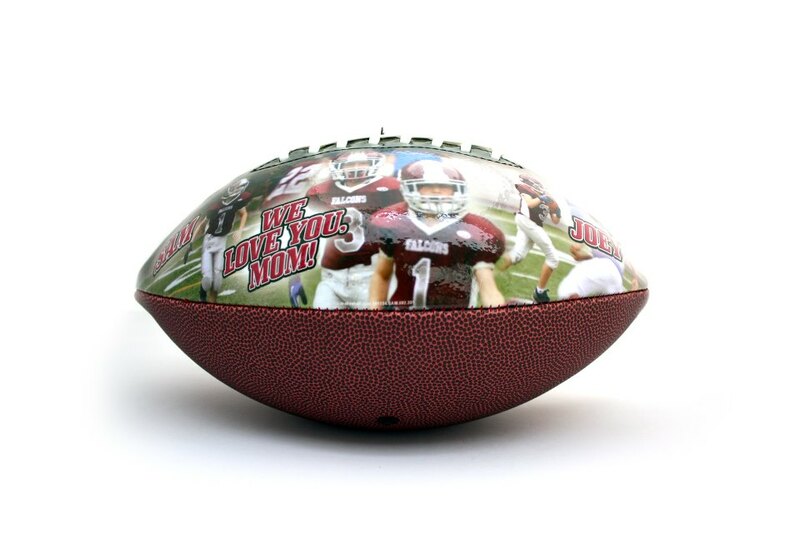 Make-A-Ball is a company that offers completely personalized sports mementos. First, buyers choose a particular ball (or puck) and the size desired. There are several options. Second, choose a background. Then choose a personal photo, logo or even phrase. The editor can help with placement and editing. In a couple of weeks, your custom ball will arrive at your door step. I've ordered a football for my oldest son. I can't wait to see how it turned out. Also, I think that the football shaped Christmas ornaments are a fun end of season token for everyone on the team. These custom options would be great for coaches gifts too. The only downside to Make-A-Ball is that our other sport, swimming, doesn't have a ball where I could make a fun gift. Not sure that goggles would work. I will have to work on that option. Don't let another sports season go to waste. Make a memory of it and get your Make-A-Ball today! Want one for yourself? Please use the Rafflecoper to enter. Disclosure: I received this item to review. All opinions are my own.I received one or more of the products mentioned above for free using Tomoson.com. Regardless, I only recommend products or services I use personally and believe will be good for my readers. This is a great memory maker! I would love to make a ball for my son (or for myself). I love, love, love football season for so many reasons. I will definitely share this with my football loving family! This is so cute - I actually wonder if my hubby would like this - its a great idea! I would choose the football with the grey background and plays with the red football helmets behind the picture frame, so cute! The football for sure~How cute!! I would choose a soccer ball with the blue design, thanks! Ladies, be sure to check out www.makeaball.com for upcoming holiday deals and promotions! This is really cool! My hubby played semi pro football so getting a football with picture of him in his uniform would be awesome!